Janie Glenn Dean remembers that day back in 2001 when she closed the County Seat restaurant after breakfast one December morning, and watched with both awe and humility as the regulars — who’d just finished plates of eggs and pancakes — picked up their chairs, carried them outside and then up the sidewalk a short spell, to what would be the restaurant’s new location where Dean was opening the next day. That sort of community support isn’t taken for granted. It’s why every day since that December morning, Dean and now her daughter, Tracy Cifers, do what they can to make sure their customers are treated like family, one piping hot homemade roll and friendly smile at a time. The County Seat celebrates 25 years in October, a milestone these days as restaurants come and go in the blink of an eye. Located in the heart of Powhatan County, literally across the street from the county’s courthouse, the County Seat is a hub. It’s where folks eat, connect, catch up, gossip. People meet their future spouses here, celebrate as a community the arrival of children and grandchildren, and find solace over nourishing food and fellowship in times of grief. Customers and employees know each other and have for years. The fried chicken and buttermilk pie are always on the menu, and the crab cakes and coleslaw have their own following. Things don’t change much, except when they have to. Ask Dean about the key to success, and she’ll tell you it has everything to do with knowing what people like to eat. But that starts with knowing people — and that happens to be a house specialty. 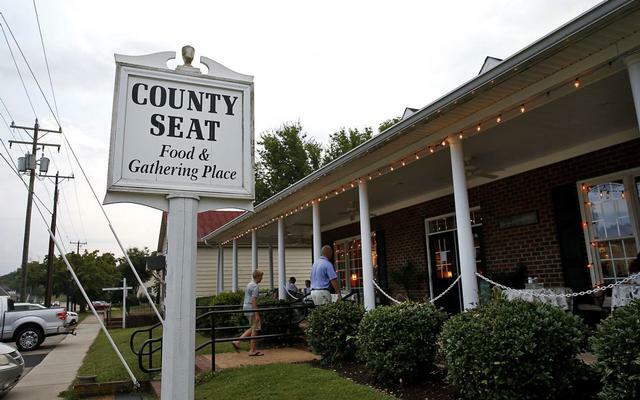 With a full menu serving breakfast, lunch and dinner, the County Seat, at 3883 Old Buckingham Road, is known for its homestyle meals and from-scratch desserts, Sunday buffets and omelet stations, and live music on Saturday nights. The fried chicken reigns supreme, but other best-sellers include meatloaf and catfish, smoked barbecue and those backfin crab cakes. Granny’s chicken vegetable soup — a nod to Dean’s late mother, known to everyone as Granny — is a daily mainstay, as are fresh salads and sandwiches and burgers served on homemade rolls. On a recent Thursday afternoon, the family matriarch sat at a large table in the open dining room, her 19-year-old granddaughter, Leah Cifers, perched on her lap. A rising college sophomore, Leah works there during the summer — another in the growing list of family members who’ve passed through the restaurant in one role or another. Dean joked that customers have become so attuned to the restaurant’s food and its staff that they know when a certain person is cooking that day — and more importantly, when they’re not. She took over the restaurant 25 years ago from its previous owner, renamed it the County Seat and moved it to its current location. (She first spent eight years in what is now the Four Seasons restaurant.) She admits that it’s her daughter who keeps it going, evolving, changing with the times. She grew up in an era when women prepared meals every day and dinners at the kitchen table were the norm. Three or four times a week, you’ll find Amelia County resident Nita Saunders and her friends at the County Seat. They first came because they knew the waitstaff, she said, and stayed because they loved the food — the deviled eggs, the buttermilk pie, the grilled shrimp and salmon salads. The place, she said, just feels like home. Customers aren’t the only ones who appreciate the sense of family. Ernestine Johnson has been a cook in Dean’s kitchen from Day One. Back then, she didn’t know Dean and simply needed a job, she said quietly. But she stayed on and as she did, the two women developed a close friendship that’s only strengthened as they’ve faced life’s joys and challenges together. “It’s been a pleasure,” Johnson said. The relative newcomer to the back of the house staff is William Shaffer, who started as a dishwasher and little by little, worked his way through the kitchen — mashed potatoes one day, homemade bread the next. He’s also responsible for the pies that fly out the door whole and by the slice.